We are not very good at mushrooms in this county. 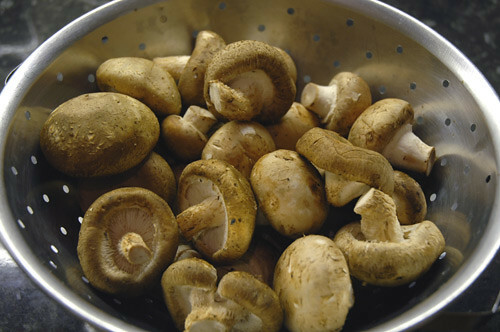 For starters, we are conned by the supermarkets into believing that button mushrooms, brown caps, chestnuts and most of the various kinds of mushrooms they sell are actually different species, but in fact they are just one species at various stages of development. Secondly, the art of actually picking mushrooms is getting more and more rarefied. The only mushroom I could positively identify in the field is illegal when dried and may result in the opening of your third eye if taken in what Bill Hicks called “heroic doses”. It is infuriating to read recipes extolling the virtues of various wild mushrooms knowing full well that you’d never have the guts the go out and actually find any. My old man could probably identify a hundred different types at hundred paces having grown up on a farm, yet, somehow this knowledge was never passed on and it is not something that you learn at a London secondary school. I heard a probably apocryphal story that in France you can take you mushroom picking haul to the pharmacy and some no doubt vastly nosed, hugely moustachioed pharmacist will identify each and every one for you. I can just imagine taking a basket of toadstools to my local Boots chemist and asking the rather harassed teenagers behind the counter to tell me if I’m going to take my own life into my hands if I make an omelette. I’ll just have to carry on paying over the odds at farmer’s markets to the canny old geezers that can tell a St George’s from a Fairy Ring or a Trompet de Mort. I wish I could mycolify. You know, identify. At my last house, I'm almost certain we were growing chanterelles. But... Y'know? I never tried one. Oh, do tell me you've read The Debt To Pleasure. John Lanchester.